Many, including most recently some 350 newspaper editorial boards, have bemoaned President Donald Trump’s attacks on freedoms of speech and press. But like much else during this presidency, these attacks tend to be discussed on a news cycle-basis. There is a larger picture here, and only by seeing it can we get a true sense of what is actually at stake. The Trump Administration is not just at war with the institutional press. In a much broader sense, President Trump has challenged a number of core principles associated with the First Amendment. These principles, and the values they support, are not partisan. They benefit us all, and so threats against them ought to concern us all. A free press is not a threat to democracy, but a condition for sustaining it. Censorial power is in the people over the government, not in the government over the people. James Madison, the architect of the First Amendment, uttered these words in a debate concerning press censorship. 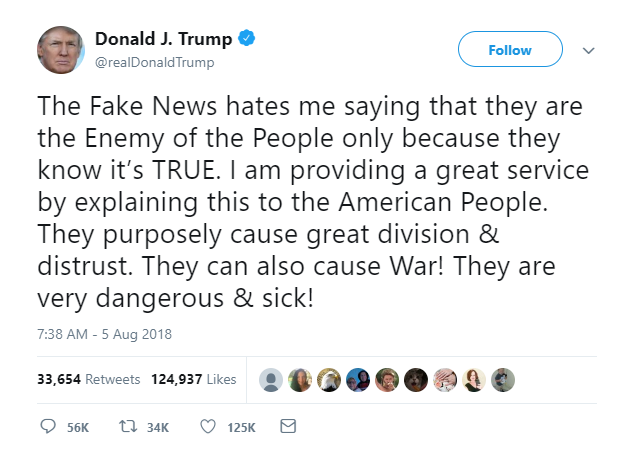 Madison had railed against the Sedition Act, a 1798 federal law which imposed criminal penalties for publishing or communicating statements about the president or the federal government that would bring either into contempt or disrepute, or incite hatred toward them. Although some were certain that the Act was unconstitutional, it was not until 1964 that the Supreme Court expressly repudiated the crime of sedition. It observed that the “central meaning of the First Amendment” is that the people must be free to criticize their government and officials. President Trump has sought to resurrect sedition. He has rewarded those who praise him and sought to punish his critics. Whether it takes the form of revoking the security clearances of former intelligence officials, or blocking critics from his Twitter timeline, this is a censorial abuse of executive power. It matters not whether the former official has a legal right to the clearance or the Twitter user has a right to comment. There is a corollary First Amendment principle at work, namely that when the government makes a benefit available it cannot deny or condition its continued enjoyment upon the suppression of official criticism. If the people are to govern, punishment for sedition cannot stand. No official can prescribe what shall be orthodox in politics, nationalism, religion, or other matters of opinion. The President’s attacks on NFL players who refuse to stand at attention, hand over heart, during the National Anthem challenges this core First Amendment principle. As Justice Jackson wrote for the Supreme Court in 1938, “struggles to coerce uniformity of sentiment in support of some end thought essential to their time and country have been waged by many good as well as by evil men.” In one of the most iconic passages ever written about freedom of speech Jackson observed: “If there is any fixed star in our constitutional constellation, it is that no official, high or petty, can prescribe what shall be orthodox in politics, nationalism, religion, or other matters of opinion or force citizens to confess by word or act their faith therein.” Insisting that every player communicate the same sentiment, in the same manner, at a public sporting event – or be fired – is precisely the sort of governmental coercion the “fixed star” principle prohibits. Speech on matters of public concern – including by public employees – must remain free. As the president continues to speak out against, intimidate, and silence his critics, we ought to keep these core First Amendment principles in mind. As the Supreme Court recognized, the principles were formed “against the background of a profound national commitment to the principle that debate on public issues should be uninhibited, robust, and wide-open, and that it may well include vehement, caustic, and sometimes unpleasantly sharp attacks on government and public officials.” During the first half of his first term, the President has posed some serious challenges to that national commitment. It is up to all of us to respond.